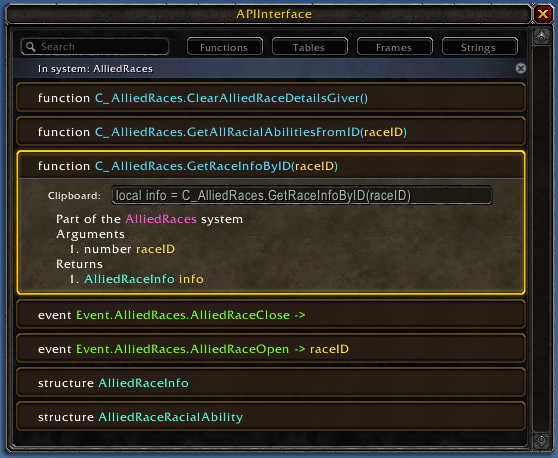 As I bumped into the in-game API documentation in 7.2 I found it rather annoying to use as it's all stuck in chat. So I end up making an addon that takes the documentation and presents it in an easy to navigate window. As it uses the official API, it also keeps itself up to date, unless they add a new feature such as the events. It uses a style similar to achievements. By default it shows all the systems available. Clicking one of them shows all functions, events, enumerations, and structures in that system. If you then click one of those it shows the documentation and an editbox where you can ctrl v the clipboard string. I use it a lot myself when creating or updating my addons, so I thought it might be of use to some of you. You can open the window with the /apii command. Very nice and a lot easier to see than the chat text. If we did likes on this site, I could not like it enough! Would be nice to have it here as well. I have never used that tool, but check the thread now and then for updated news. This is because the tool only supports Git, which I never learned (the Light knows I tried) and use SVN instead. It doesn't even use Hg (Mercurial) even though I also have never used that repository type either. The tool itself doesn't require Git, Hg nor SVN, only TravisCI does. You could run it locally if you'd prefer. This is because the tool only supports Git, which I never learned (the Light knows I tried) and use SVN instead. It doesn't even use Hg (Mercurial) even though I also have never used that repository type either. As P3lim noted it will work with more than just GIT. However If you wanted to give GIT another shot (I cant recommend it enough, i struggled with it at first as well) download SourceTree, I found for my self as well as some of my Co-Workers getting a decent UI to use with GIT helps more than anything. The next part to GIT is to understand is how it differs. (I am going to oversimplify here) With GIT your local copy is basically a server. The Server (aka GitHub, bitbucket) is basically another person. You make changes, commit the changes to your own local copy of the server. Then you "Push" the changes to GitHub. This Disconnect allows you to work offline and make many changes without internet then push all your changes when you can. Other people (Or you on a different system) can then "Pull" your changes from GitHub, basically its SVN's Sync but split into 2. The ability to work offline and make many changes without communicating with the server is a big plus for GIT's flexibility. One of the other big things in Branches & Tags. People have shoe-horned Branches support into SVN with the Tags, Trunk, Branches folders but the process is alot more streamlined & native with GIT since each tag and branch are not all copies of the code, it leads to much smaller repository sizes. Back on topic: This looks great i think ill have to mess with it tonight.